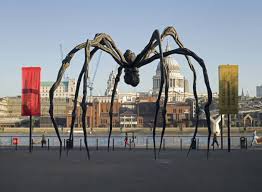 When Tate Modern opened in 2000, the first artist to display work in the gallery’s vast Turbine Hall was Louise Bourgeois (1911-2010). 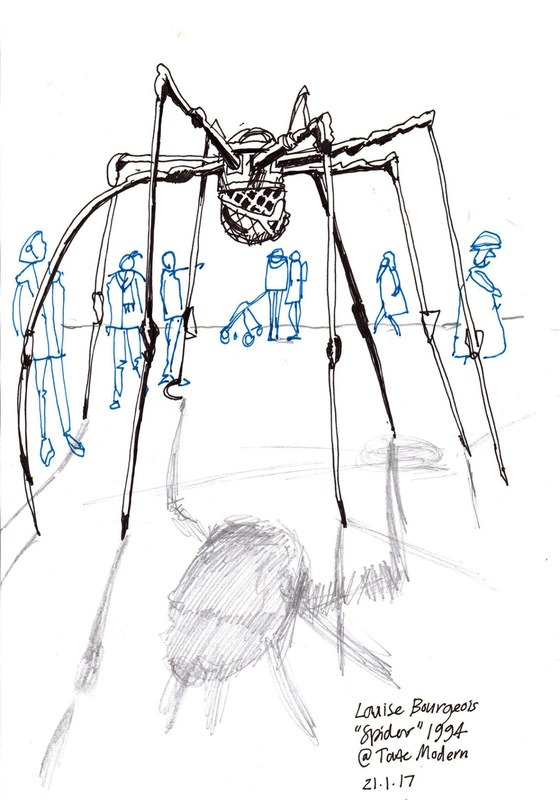 Work on show included Maman (1999), the largest of her spider sculptures. 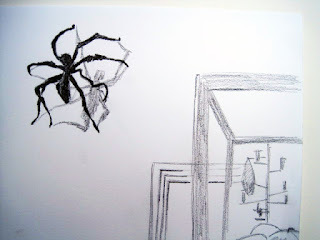 The spider has become one of Louise Bourgeois’ most well-known themes. Her parents ran a workshop for tapestry restoration. The title Maman alludes to the strength of her mother, with metaphors of spinning, weaving, nurture and protection. Urban Sketchers London returned to Tate Modern for our sketchcrawl on Saturday 21 January 2017. 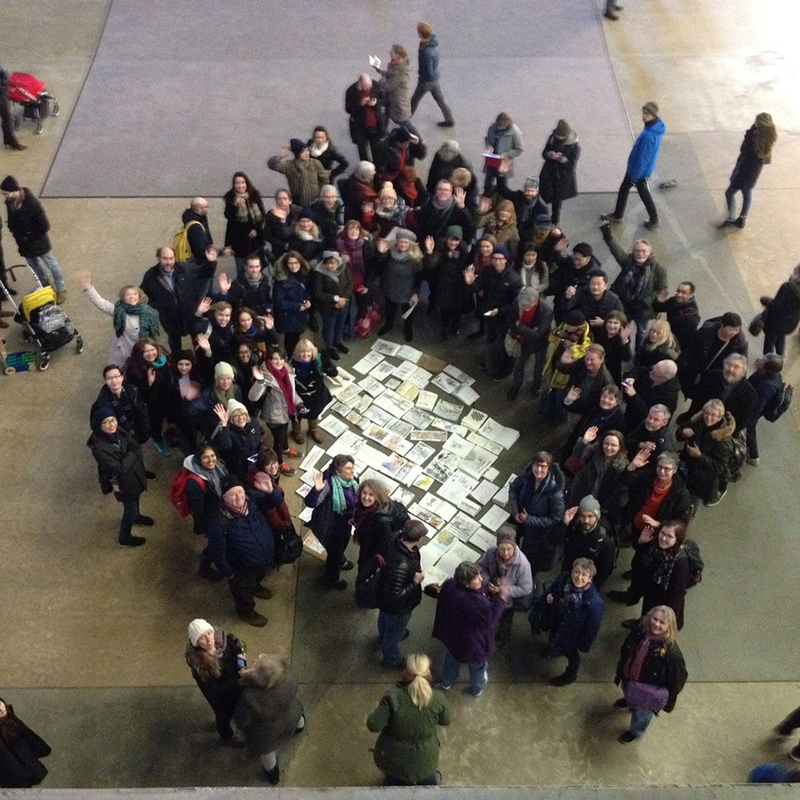 Here are some of us in the Turbine Hall, looking at the sketches done that afternoon. [By John Webb.] 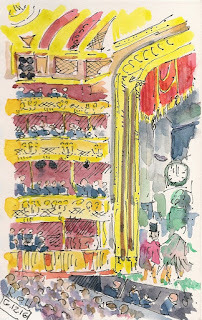 I missed the Sketch Crawl before Christmas in Covent Garden however we went to the Ballet a couple of days earlier and fortunately in sufficient time to pop a sketch into the book. Really need a bigger page and smaller paint box. 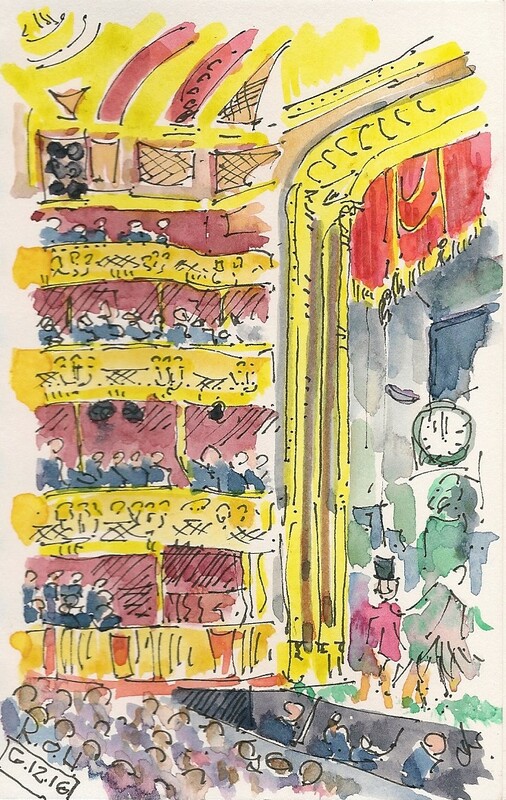 The Royal Opera House is going through another makeover - which is good; can't stand still - in fact there have been 3 theatres there since 1732. The first 2 burnt down, a common hazard in the days of candles and gaslight. The current one dates from 1858 with the most recent 1996/99 major additions making it a fantastic experience...the auditorium retaining its historic wow factor. 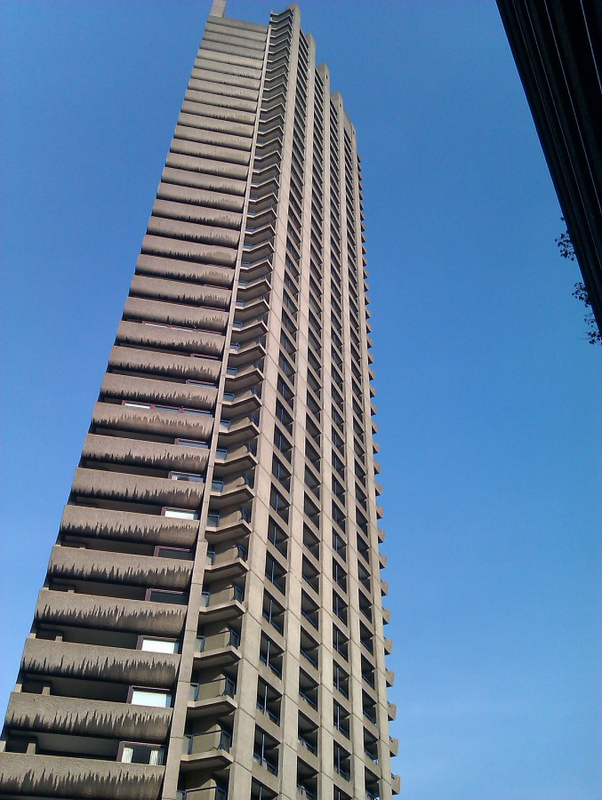 Join us to draw at the Barbican in the City of London. 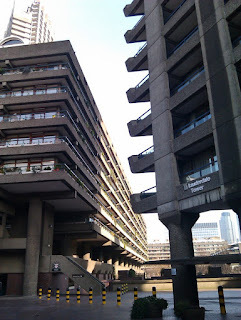 The Barbican Centre is one of London’s major arts centres and the Barbican Estate is a landmark modern housing development by architects Chamberlin, Powell and Bon. Everyone welcome, bring your own drawing materials, just turn up on the day, which is free of charge. 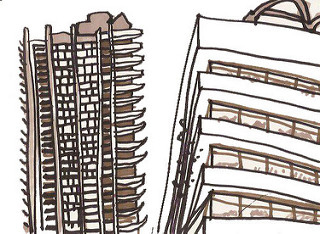 11 am: Meet inside the main entrance of the Barbican Centre, on Silk Street, for an introduction and short discussion about area's attractions and good drawing spots, lead by Olga Mackness. 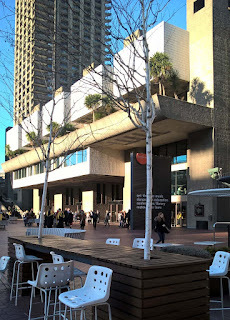 1.00 pm: midway meeting by the main water feature in the Barbican estate Lakeside Court or if wet, inside in the Barbican Kitchen cafe situated at the same place, opposite the water feature (Level G). 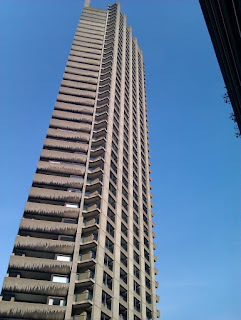 Finish at 3.30 pm at the Barbican Centre Lakeside Terrace Entrance for the group picture and discussion. 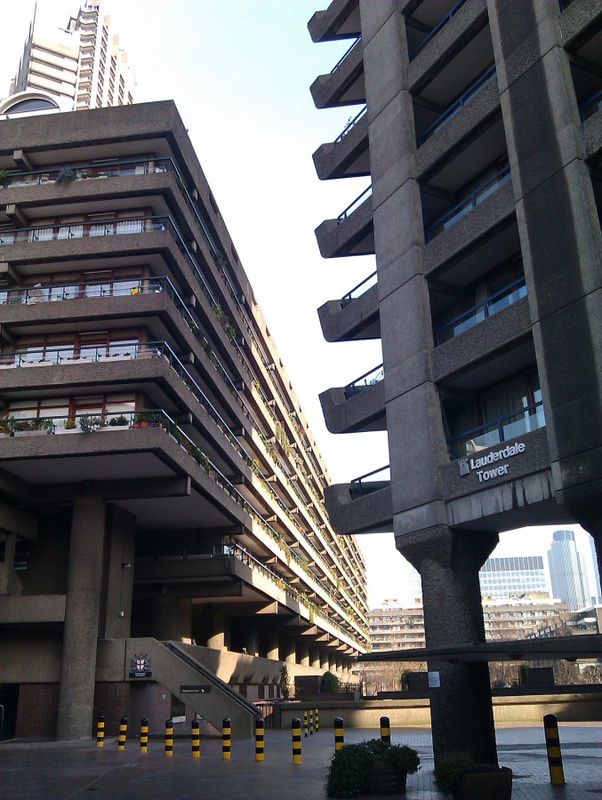 Barbican Centre: the arts centre offers views of the surrounding area and interesting modern interiors. There are also opportunities to draw people and activities in the Centre, and there will be a new temporary light installation by Omer Arbel in the Foyer, level G.
Barbican Estate has many public courts at different levels – exciting opportunities to draw panoramic scenery. 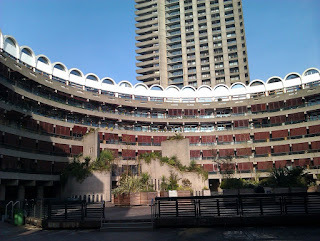 Architecture of the complex is fascinating and very distinct. 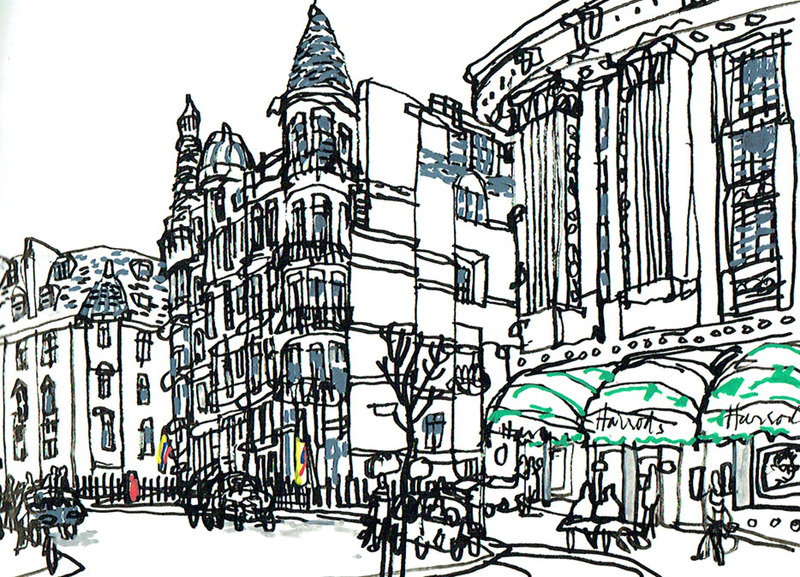 It is a very good chance to enrich your portfolio with sketches of classic modern architecture. 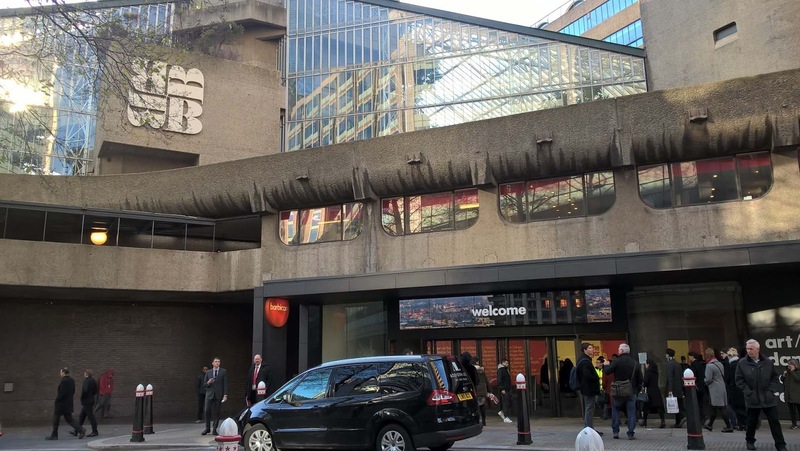 There is an exhibition about the architecture of the Barbican in the Barbican Centre Foyer, level G.
St -Giles -without -Cripplegate Church: located within the Barbican complex, on Fore Street. 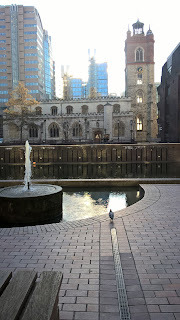 This medieval church survived the Great Fire of London in 1666. Oliver Cromwell was married in this church and John Milton is buried there. There are many marble portraits in the church – of John Milton and other famous people associated with the church. Interesting information is to be discovered there and interiors are great for sketching. 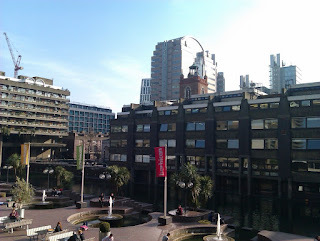 The Museum of London is located at the south-west corner of the Barbican Estate, at the junction of London Wall and Aldersgate Street, above street level. It has free admission. 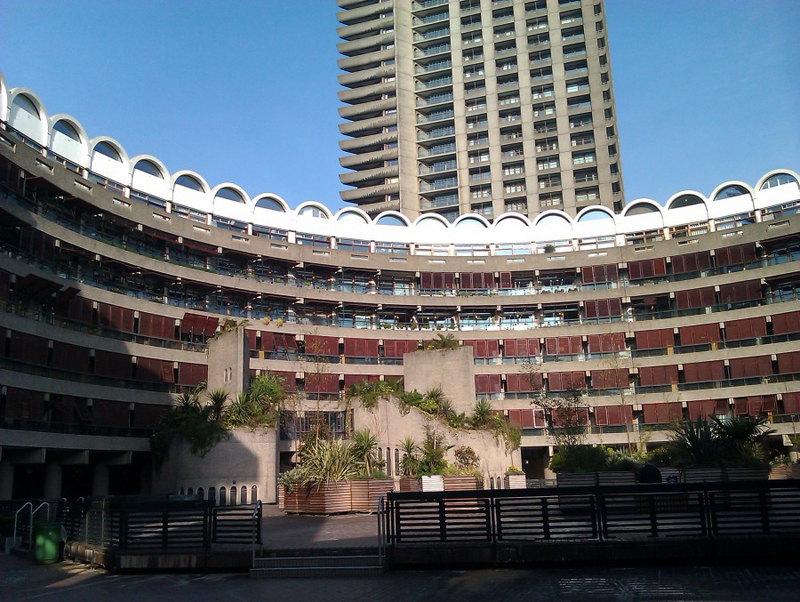 Nearby, there are remains of the Old London Wall dating from the Roman era, near the south west corner of the Barbican Estate. The day offers opportunities to draw indoors and out, depending on the weather and your preferences. 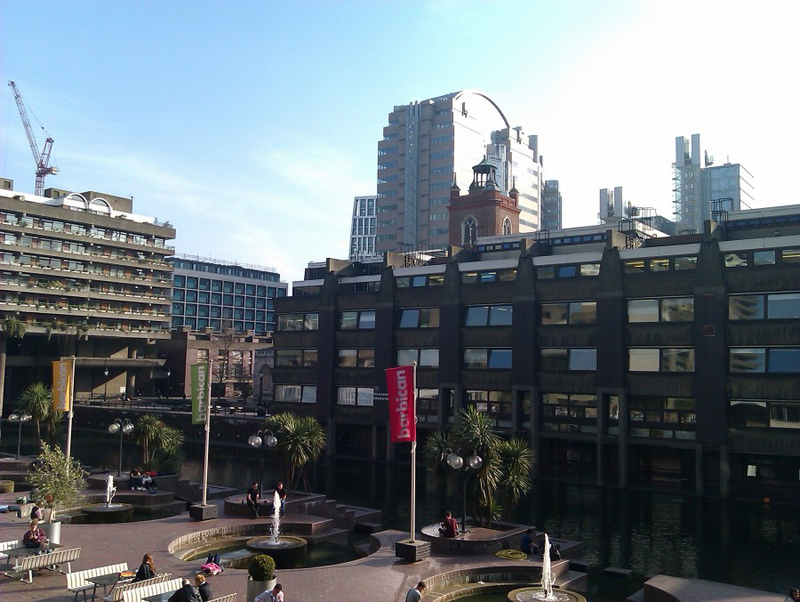 There are many cafes and bars inside the Barbican Centre and surrounding area, suitable for all budgets and tastes. 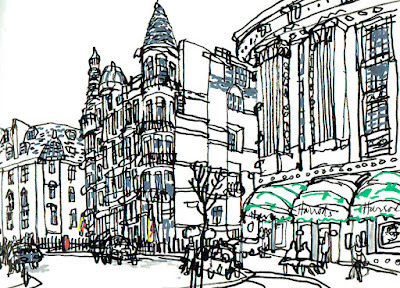 We look forward to this day sketching together in London. Day organisers – Olga Mackness and Lis Watkins. Top drawing by James Hobbs. [By James Hobbs.] Cycling in the west of London, I passed by the Ecuadorian embassy, which, with the WikiLeaks founder Julian Assange still inside more than four years after claiming asylum there, is still in the news. Obama's decision to release the whistleblower Chelsea Manning has heightened speculation Assange will finally make an exit. The embassy, which shares a building with the Colombian embassy, is slap-bang behind Harrods, and watched by bored-looking press photographers from across the street. There was the hope that he would emerge as I drew the scene, but he will want, no doubt, more of a show and a larger audience when that time comes. 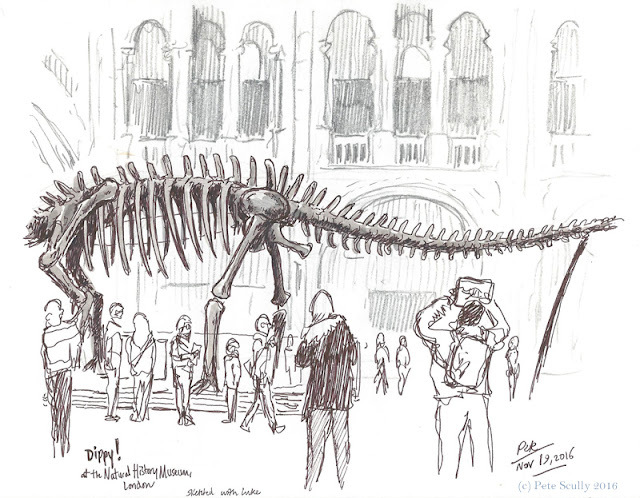 [by Pete Scully] Dippy, the beloved Diplodocus at the Natural History Museum, is moving! This week, on the 4th of January, ol' Dippy will be packed up into lots of boxes and sent on tour around the country, while the Hintze Hall, the grand space in the Museum that has been Dippy's home since I was a little kid (1979, though Dippy's been in the Museum for more than a century), is prepared for the installation of a large Blue Whale skeleton. I'm sad to see Dippy go, but excited to see a new change in my favourite of museums. 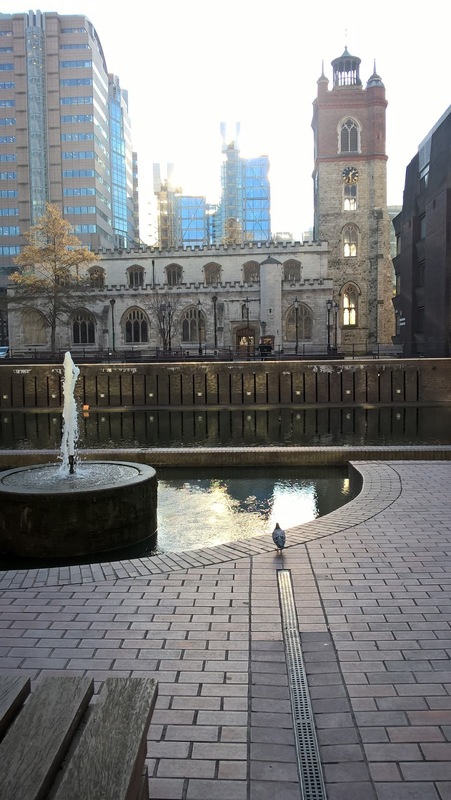 I visited London over Thanksgiving break in November. Yes, you don't have Thanksgiving in the UK, but my Californian son was off school that week and flights were cheap so we took advantage, and came back to our London family. Britain still seems to have Black Friday though, but if you're not queuing up outside Best Buy at 4am and spending the rest of the morning in Target then you're not really doing it right. It was a good week to visit London, with the UK kids still in school and Christmas starting to really get into gear - South Kensington is lovely in wintertime, with the ice skaters outside the Natural History Museum. My son loves geology so we spent the longest time looking at all the rocks and minerals on display, before finding a seat to sketch Dippy. We couldn't see him all, so only sketched his body, and being a little pushed for time I never managed my two-page Diplodocus spread this time. But I am glad I got to see hime one last time before he goes plodding around the country, to Dorset and Newcastle and so on (see details of Dippy's tour on the NHM wesbite). 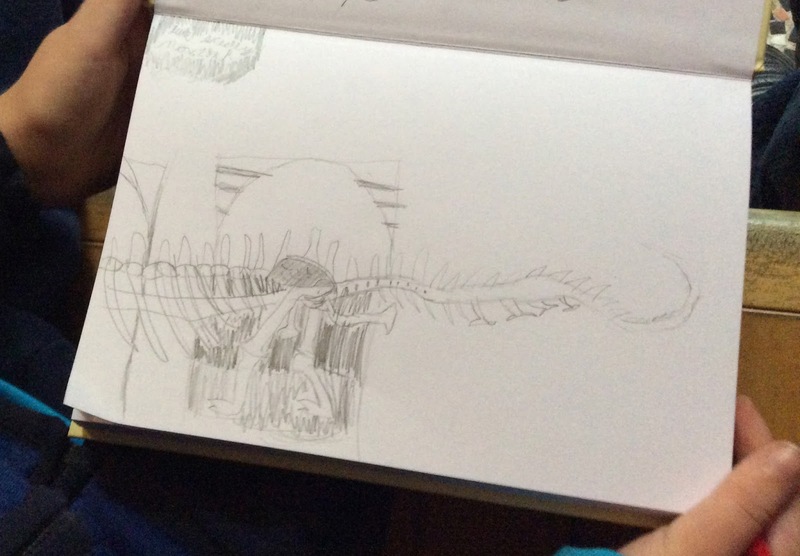 Here is my son's sketch of Dippy, in his new NHM sketchbook.